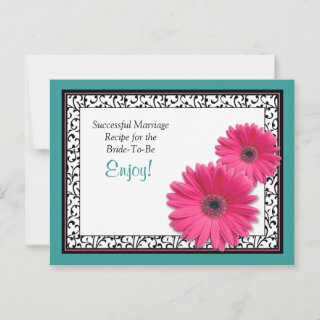 The text on this teal, black, white, and pink gerbera daisy "successful marriage" recipe card for the bride to be is fully customizable. You can change it using the personalization tools on the Zazzle website. This recipe card can be enclosed in the matching bridal shower invitation so that bridal shower guests can fill out the back with their words of wisdom for a successful marriage and bring the card with them to the shower as a wedding keepsake for the bride to be. You could also use this in a birthday party invitation by changing the text on both the invitation and this card. 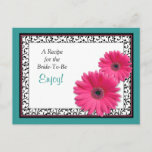 Zazzle recipe cards cards are printed and shipped in the US, even if ordered off of international sites. Please allow sufficient time for international shipping.